The station is owned by Amtrak, which has frequently closed escalators and elevators over the past few years. One of the two elevators has been out of service altogether for several years. They are in no condition to re-open. According to a recent NBC Boston report, every escalator and elevator has expired state certifications. NBC Boston first reported on the station three years ago, so this isn’t a new story. It is just one which has grown worse. Amtrak says it has no responsibility to make repairs, citing federal law which exempts it from meeting all state and local building regulations. State officials say they have met with Amtrak, to no avail. Failure to maintain the escalators and elevators creates a safety hazard for commuters and puts an extra burden on the handicapped. NBC Boston interviewed a rider who was legally blind and spoke about having to climb the Westwood station’s tall staircases. As a result, he has missed his special needs van on some days. 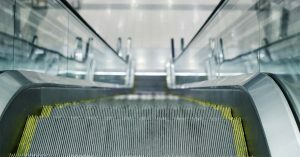 We need to learn from past tragedies on escalators and elevators, including the fall that killed 4-year-old Mark DiBona in 2011. The child fell from a defective second-floor escalator at the Auburn Mall. The escalator had a 6 inch gap, which exceeded state regulations. Lawyers for the boy’s family said the escalator management company was aware of the gap and had filed plans with the town to fix it. But the company never followed up. The little boy suffered a head injury in the fall and died the next day. Hopefully, the state, MBTA and Amtrak will reach agreement on the much needed repairs at the Westwood station soon. All three have a responsibility to the public and commuters. But it’s also important because another public safety concern has recently arisen at the station. After a long day in Boston, every commuter just wants to get home. Over the past year, the rush has gotten worse at the Westwood station. Some commuters are now running to their cars to beat traffic backups and 20-minute delays leaving the station. The traffic backups are a new development. Drivers used to have two choices to pay for parking. They could pay inside the station with their credit card or they could simply drive through the parking garage exit. The parking fee would be deducted from their car’s EZPass. Now, the MBTA requires drivers to stop at the parking exit and select how they want to pay. Meanwhile, traffic lines up and pedestrians are put at risk. WBZ’s I-Team reported on the parking garage earlier this month. The MBTA said the new system has reduced duplicate charges, resulting in fewer refunds. But things need to change at the Westwood station before there is a serious pedestrian accident. If you see a safety hazard in any MBTA station, we encourage you to take a photo with your cell phone and report it. You can also report equipment that is out of service for a long period of time. We suggest reporting the problem to at least two offices – the MBTA and the local police department. A local police department can log your complaint immediately while the MBTA or MBTA police may not respond for a few days. You can also try submitting complaints to the town officials in the community where the MBTA station is located. Try the local building department, the Board of Selectmen or City Council office. Other resources are the state Department of Transportation, your state representative and your local regional transportation agency. These offices may not be directly responsible for a train or bus station, but it may help to keep them aware of ongoing transportation and safety issues. MBTA Customer Support. This page gives you the option to upload a photo. The Boston personal injury lawyers at Breakstone, White & Gluck are experts in handling claims involving premises liability and injuries caused by defective property conditions. If you have been injured by someone’s failure to maintain their property, learn your rights. For a free legal consultation, contact Breakstone, White & Gluck at 800-379-1244 or 617-723-7676 or use our contact form.